Glass Vessel Sink in Titanium with Waterfall Faucet in Chrome is rated 5.0 out of 5 by 12. 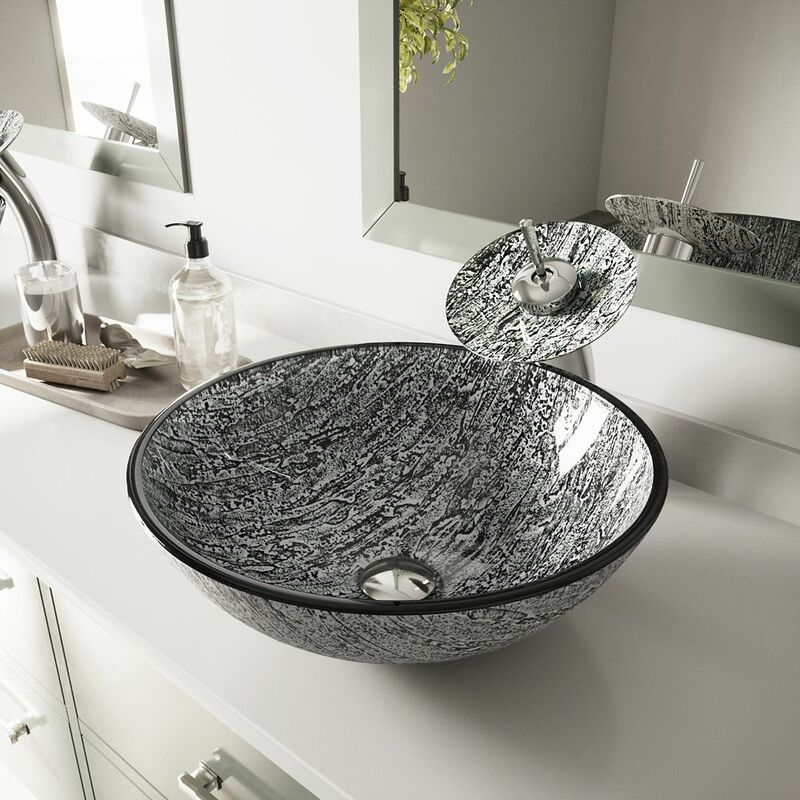 Rated 5 out of 5 by neta from Modernizes my bathroom I searched for a vessel sink for months-when I found this one I ordered it and am so glad I did- turned out better than I anticipated Thank You! Rated 5 out of 5 by SweetMrsK from Absolutely gorgeous... Used in a flip house...I think they sold the house! Rated 5 out of 5 by Nicole from Beautiful sink! We bought this sink and faucet online so we hoped for the best...and its beautiful! My husband even likes it more than he thought he would. This coming from someone who wasn't sure he'd like a bowl and waterfall faucet. Looks beautiful and works really well in our newly updated bathroom. Wanted a whole new look and that's exactly what we achieved. We receive compliments every time people see the bathroom. Glad we made this purchase. Rated 5 out of 5 by Kirk from Looks absolutely Stunning. The sink came with all the parts... Looks absolutely Stunning. The sink came with all the parts I didn’t have to go to And get anything. Works great, Awesome design. Rated 5 out of 5 by Rab3 from This is an awesome sink and waterfall faucet. I am very happy with both. Nothing but good comment... This is an awesome sink and waterfall faucet. I am very happy with both. Nothing but good comments. People ask me where I purchased this from. Rated 5 out of 5 by PJ7832 from Great faucet and sink combo. I bought this a couple months ago for a bath remodel. I was very impressed when I opened the box and found the parts wrapped in a fabric bag. It just shouted quality. we are very happy with our choice and love the waterfall faucet. Install was easy, the only thing that would have made it easier would have been a template that would show the proper spacing between the faucet and bowl. Several people who have seen it have been impressed. Rated 5 out of 5 by handyguy from Received the sink and it looks great however I haven't installed it yet so will review it after t... Received the sink and it looks great however I haven't installed it yet so will review it after that. Rated 5 out of 5 by fabulousfab from Love it! I recently bought this sink, it's beautiful. It was well packed, got it in perfect conditions. It's perfect for my new remodeled bathroom.